Steffi has been a selective mute for most of her life - she's been silent for so long that she feels completely invisible. But Rhys, the new boy at school, sees her. He's deaf, and her knowledge of basic sign language means that she's assigned to look after him. To Rhys, it doesn't matter that Steffi doesn't talk, and as they find ways to communicate, Steffi finds that she does have a voice, and that she's falling in love with the one person who makes her feel brave enough to use it. 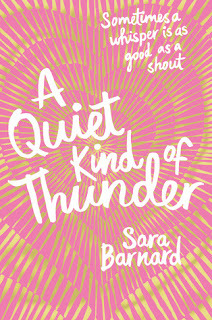 From the bestselling author of Beautiful Broken Things comes a love story about the times when a whisper is as good as a shout. 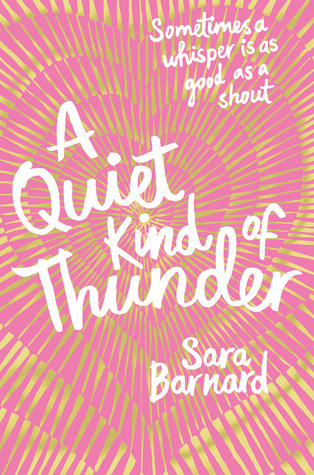 A Quiet Kind of Thunder was one of my favourite reads of 2016. I was lucky enough to get an early copy which I devoured back in October. It is a perfect example of everything I love about UKYA. For me the main appeal of this book is the love story between the main characters Steffi and Rhys. It's a quietly sweet love story which captures that first experience of falling in love. You can't help but fall in love with their story because it is so sweet. I also liked how the book looks at a disabled character looking at Rhys who is deaf and how he goes about his normal day to day life being under estimated by those around him. Equally the look at Steffi's mutism was really interesting again particularly seeing how she is under estimated by those around her how the impact that her anxiety has on her day to day life. I also loved the depiction of female best friends within the book. Tem, Steffi's best friend, if a brilliant character and I loved the relationship between the two. All in all a book I adored and highly recommend.